"Play the third installment of the PopCap series of addictive Bejeweled games." Bejeweled is a pretty well known game that has been remade over and over by various other developers of video games in the past. However, PopCap Games brings back the addictive game with very pleasing to the eye graphics, vivid colors, and very detailed textures in an HD game that you can play on many different devices including just about every type of mobile device in Bejeweled 3. This version is the free demo that you can try out for your Windows system. There are four modes that you can choose from in Bejeweled 3. Those are Classic, Zen, Lightning, and Quest. However, there are also secret modes that you can unlock as you play the game. You must meet the specific requirements in order to unlock the game modes, so you will not be able to play them if these requirements are not met. You can look online if you are curious as to how you can meet these requirements and be able to play the secret game modes of Bejeweled 3. The mode notable game mode is Classic mode. 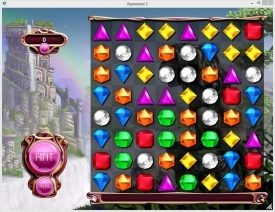 In this game mode, you play the classic game of Bejeweled in all of its glory with the detailed graphics in Bejeweled 3. As long as you know how to play Bejeweled, you are good to go. But, it is pretty simple - all you really have to do is match three or more similar gems in a row in order to earn points. The more in the row of similar gems, the more points you will get. Also, if gems align after you line up your first row of gems, more points will be given to you since those are considered combos. Bejeweled 3 is an awfully addictive game that can kill a lot of time if you have the time to allow. Give this free demo a try by downloading it by clicking on the download link above!